The FSA Compressor Plug replaces the traditional star-nut and headset top cap assembly for safe use with carbon steerer tubes. Fits 1-1/8" steerer tubes. Includes cap, bolt, and expander. 53g. Easy to install and does the job well. Well made & an super alternative to the star nut on alloy steerer tubes, too. I find that this compressor/expander plug opens more fine tuning/adjustment possibilities when setting up a headset. This is the only kind of top cap assy. I use on my racing bikes. in my opinion, this kind of part makes the star-nut design obsolete. I started using FSA's expander plug a few years ago, per the advice of my LBS. Now it's on all my cyclocross and road bikes because it's easy to set up and keeps your headset locked down snug without worry. 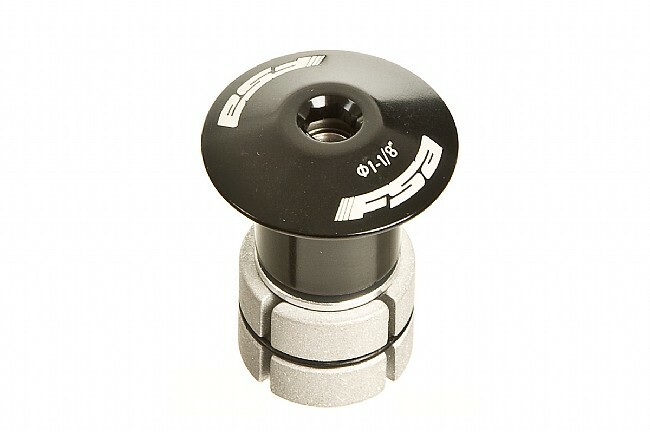 Unlike other plugs that have shims and small parts that can come loose and fall into your steerer tube, FSA's plug is one unit with two adjustment points-the expander bolt and top cap. Once you've set the expander, tighten the cap, then stem bolts, and you're ready to roll. Too easy.